In Germany – where the first recorded reference to Riesling appears – winemaking dates back to the 1st Century A.D. 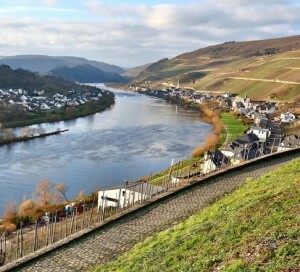 But Riesling doesn’t enter the picture until the 15th century when it is first documented as being grown in the Rheingau area and slightly later in the Mosel Valley. The earliest of these references dates from 1435, when the storage inventory of Count John IV of Katzenelnbogen in Rüsselsheim (a small principality on the Rhine, close to today’s Rheingau) lists the purchase of “umb seczreben Riesslingen in die wingarten” (translation: six Riesling vines in the vineyard). The spelling Riesslingen is repeated in many other documents of the time. The Riesling grape is most likely a descendant of a wild vine, Vitis vinifera sylvestris, native to Germany. Riesling’s most notable ascendance begins in the 17th century after the end of the Thirty Years’ War (1648). Alsace was ceded to the French and devastated vineyards were replanted – mostly with Riesling – to replace inferior grape varieties. Powerful figures in the Church used their authority and influence to promote Riesling as well. The most important decree came from Clemens Wenzeslaus, Elector of Trier (in the Mosel), on May 8th, 1787. Clemens ordered the removal of all inferior vines to be replanted with more “noble” grape varieties, which was a boon to the rise of Riesling vineyard plantings. German Riesling achieved great success in the 19th century, fetching prices on par with the great French crus of Bordeaux and Burgundy. But this trend did not last long. War again devastated German vineyards in the first half of the 20th century. And when German vineyards were replanted, it wasn’t always with Riesling. Technological and scientific advancements led to experimentation in the vineyard and the development of earlier ripening new grape varieties like Sylvaner and Müller-Thurgau. Vineyard yields increased astronomically and wine production entered a phase focused on quantity over quality. Mercifully, the trend toward quality is again ruling the day. Since 1996, Riesling has regained its status as the most widely planted grape in Germany…and the varietal is swiftly gaining popularity today both in the Old and New Worlds. This information is provided, with gracious permission, from the Riesling Rules Book of IRF Friend Pacific Rim Winery.